Simon Linden is again working on improving group chat, with further tests being carried out during the Server Beta meeting on Thursday June 26th. Currently, the emphasis is on further improving reliability when engaged in group chat and moving between regions (either via teleport or directly by crossing between regions). A couple of people reported their chat windows appeared to freeze a lot less when switching between group chat sessions or following a teleport. Whether this was actually the case or a placebo effect is unclear, as Simon indicated he couldn’t see why it might be any different at this point in proceedings. An odd bug has been discovered on Magnum, which may be related to the Experience Tools code. It is defined in BUG-6438, “Objects attached via llAttachToAvatarTemp to object owner detach when script is removed from prim inventory”. Essentially, using a script in an object which uses llAttachToAvatarTemp to attach an item to attach itself to the creator of the object, and which uses llRemoveInventory(llGetScriptName()) to remove the script from the object, results in the object itself detaching and being deleted. If the object is used by someone other than its creator, it will attach and the script will be correctly removed without detaching the object as well. It’s not clear if this happens with objects with multiple scripts in them or not, as it has only been tested against objects with the temp attach script in them. Investigations are continuing into a fix, but in the meantime, it is believed that the Magnum code won’t be moving to the Main channel in week 27. There is a viewer rendering issue, which can make itself particularly known when using the LSL functions for materials, where the face of an object will not be rendered, and the viewer will receive a lot of log spam (see BUG-6187). While things got sidetracked so he couldn’t expand on things, Maestro Linden did indicated at the Server Beta meeting that the issue is continuing to be looked at. Monday June 23rd was notable in two worlds as a special occasion. For the virtual world of Second Life, it marked the 11th anniversary of opening the doors to the public. On Mars, it marked the completion of Curiosity’s first Martian year on the planet (687 days). 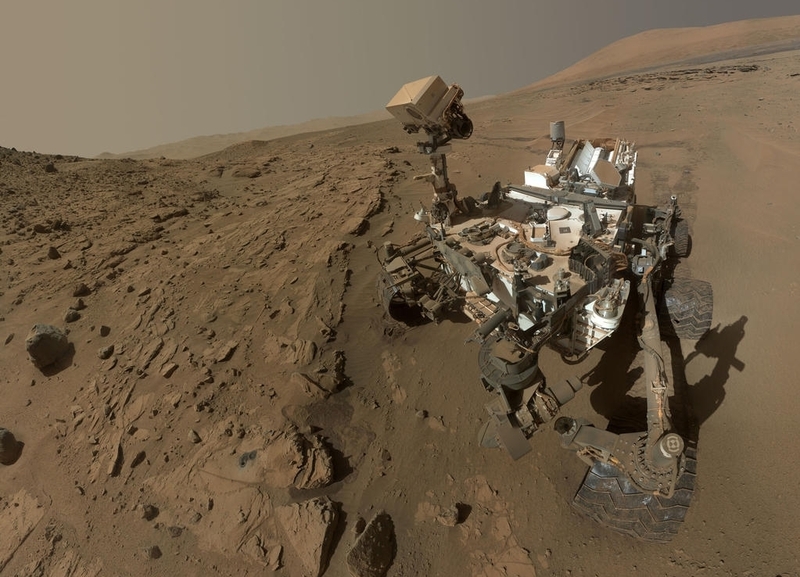 To mark the event, NASA released a “selfie” of the rover as it sat next to a rock called “Windjana”, which was the site of the rover’s third drilling / sample gathering operation, in the region dubbed “The Kimberley”. The images used in the picture were captured using the Mars Hand Lens Imager (MAHLI), located on the turret mounted on the rover’s robot arm, were captured on 613th Martian day, or Sol, of Curiosity’s work on Mars (April 27th, 2014, PDT) and Sol 627 (May 12th, 2014, PDT). Combined, they show the rover in a parked configuration together with the sample gathering hole cut into “Windjana”, the drilling operation having taken place on Sol 621 (Monday May 5th, 2014, PDT). Since that time, the rover has resumed the drive down towards “Murray Buttes”, the point where it is hoped Curiosity will be able to bypass a line of sand dunes and make its way onto the lower slopes of “Mount Sharp”, more properly called Aeolis Mons, the large mound occupying the central area of Gale Crater and the missions’ primary target for investigation. Curiosity is now over half-way to “Murray Buttes”, with no further major waypoints to be examined on the route. however, due to the wear-and-tear on the rover’s wheels while traversing a part of “The Kimberley” and “Cooperstown” before it, the route southwards has been revised somewhat to offer smoother driving terrain for the rover. The added wear-and-tear of the wheel first became something of a concern in February of this year, and later prompted a revision to in the planned route to reach the desired waypoint at “The Kimberley” and also in the rover driving team perfecting new techniques for driving the rover – such as by taking it backwards over some terrain. The (Martian) year to date: from Bradbury Landing in august 2012, through “Glenelg” and “Yellowknife Bay” and onwards to “The Kimberley”, Curiosity’s travels in Gale Crater and, in white, the planned route to “Murray Buttes”. Following its departure from “The Kimberley” on Sol 630 (May 15th, 2014, PDT), the rover drove almost continuously for a month, covering a further 1.2 kilometres 0.75 miles), and is still continuing onwards. Although Curiosity’s route will carry it past the majority of the sand dunes between it and “Mount Sharp”, it will have to traverse an area of sand in order to reach its major target. To help with this, the rover’s Earthbound “stunt double”, dubbed the Scarecrow, was taken out to the Dumont Dunes in California’s Mojave Desert, near Death Valley, where it was put through a series of test drives over real and artificially constructed sand dunes and various terrains. 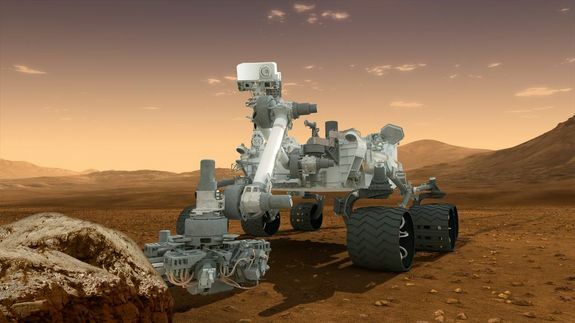 This allowed engineers to examine the rover’s behaviour over softer terrain types, enabling them to better understand how the rover might react when encountering similar surfaces on Mars.